It has been my privilege for over a year now to learn and grow as a member of a class of 160 hard-working medical students. As president of my class, I witness firsthand the efforts of a multitude of student doctors, whom I would describe as fully engaged. Indeed, the rigor of our education makes this a requirement. Engagement to succeed academically, however, is only the beginning of what is required to make an impact on the world around us as medical students. Everyone I know came to medical school with a foundational desire to have an impact on the world, whether a generalized desire to “help people” or an unrelenting drive to find a cure for the disease that took a loved one. We all started this journey fully engaged—not just to gain knowledge, but to have an impact outside of our neural circuits. As president of my class, my ongoing project—the impact I wish to have—is to empower my classmates to do exactly this. The paradox I’ve witnessed is that as we work to expand our knowledge, we become depleted of the elements required to have an impact outside of ourselves, despite our desire to do so. We disconnect from others under the burden of constant tasks. Our personal stressors distort our perception of the needs around us, and we are often worn down—exhausted in mind, body, and spirit. In my estimation, three things are required to have an impact outside of oneself: being connected to others, having the perspective to recognize a need, and having the resources to make a difference. Having a deficit in these elements, we often miss the opportunity to practice what brought us here: that desire to have an impact. Building connection, perspective, and well-being in my community of student doctors is therefore my goal. As this project is ongoing, I will offer a cross-section of my engagement in it during this current week. Connection is important for my class as the foundation for reaching outside ourselves. To foster interconnectedness within my class, I work together with my vice president to check in with each member of my class on a four-week rotation to ensure that nobody becomes disconnected. We keep a running list that resets every four weeks; as of now I have 22 people to follow up with this week. This proactive engagement takes time, but it is vital to my goal of fostering connection. Perspective is my second emphasis, as without a clear perspective on the needs of one’s community our impact is ineffectual at best. 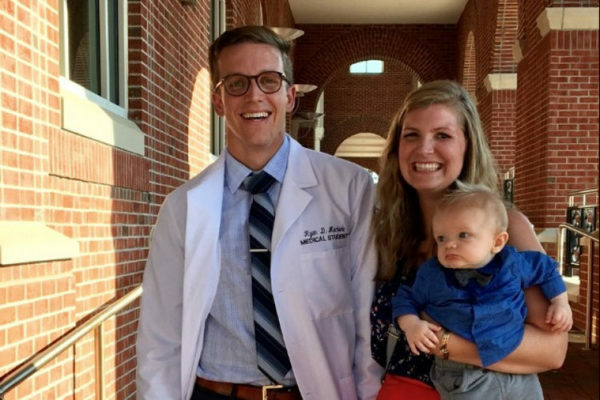 As part of the Campbell University Community Care Clinic research team, I’ve had the opportunity to produce research that empowers my fellow student doctors to make a greater impact on our community. This week, I’m working with my team to finalize a manuscript that investigates the needs of specific patient populations in the clinic. We retrospectively analyzed our patient charts and determined that several patient groups seen at the clinic are at exceptionally high risk for specific sexually transmitted diseases. These findings will be used to develop patient-centered initiatives, including better education and improved screening, ultimately enhancing the quality of care delivered to our community. Well-being is my third emphasis, as without personal well-being, one has little to give. In pursuit of promoting mental health, I hold weekly “office hours” as a peer navigator in which I set aside time to meet with students who may be struggling in order to help them problem-solve and connect them with on-campus resources. In pursuit of promoting spiritual health, I’ve collaborated with faculty and fellow students to initiate a weekly worship and devotional service. In this same vein, I’ve also initiated an Interfaith Council to foster inclusivity and dialogue on medical issues with people from all faith backgrounds. As I see it, everything we are doing now as students is practice for our lives as physicians. The things we practice now will become easier, and the things we forego will become more difficult. Choosing to reach outside ourselves in service to others should be part of this practice if we intend to make a career out of it. As a future physician, I recognize that the obstacles that may prevent us now as students from having an impact on the world around us will always exist throughout our careers in medicine, and it is my hope that this project of empowering others through total engagement of my community will never reach a conclusion.